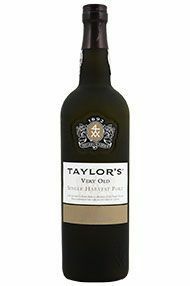 The 1967 Very Old Single Harvest Port is Taylor's new release in its ongoing 50-year Colheita program (or, as they prefer to say, "single harvest tawny port"). This should just recently have been released into the marketplace by the time this review appears. It is a typical Douro blend, coming in with 163 grams per liter of residual sugar and 20.7% alcohol. Taylor's series of 50-year single-harvest tawnies are impressive and always on the mark. This year is no exception. This molasses-flavored beauty emphasizes its complexity, seeming elegant in the mid-palate, but remarkably concentrated in flavor. Despite that concentration of flavor, this never seems even a little jammy. It is also wonderfully persistent on the finish. The most notable features here, though, are the smooth, unctuous texture and the complexity--the mature flavors, not only molasses, but a bit of seared caramel. It was interesting revisiting this a few days later, by the way. Some say these long-aged tawnies never change. I never believed that was true and this is a good example. On opening, there was a touch of a hard edge and it was sometimes just a little harsh on the finish. A couple of days later that was literally gone and after a week or more, this seemed remarkably graceful and impeccably balanced. It eventually seemed even a touch understated. This was bottled in 2016 with a bar-top cork. As noted on occasion, wines aged this long in barrel can in theory last indefinitely, assuming no cork failures, but it is ready and the bar-top cork means it is meant to drink now. Mark Squires, The Wine Advocate. 30th December 2016.